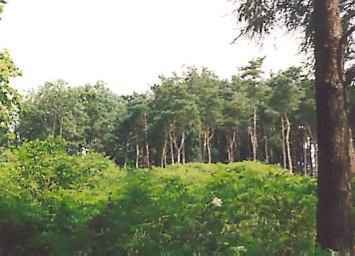 Park Mount is an earthwork motte and bailey fortress, of the immediately post-conquest type. The castle stands on at north-east end of a natural sand ridge, which slopes abruptly down to the River Arun on its north-west edge. The large round motte encased by a wide ditch, has been damaged by quarrying on the west side, destroying part of the summit. To the west is a small kidney-shaped bailey, which is defended by the steep slope and a wide southern ditch dug across the ridge. On the south-west side of the bailey, close to the slope is an original causewayed entrance. The houses and buildings that Alard de Fleming had in the manor of Pulberg where his ancestors formerly dwelled, had been lately burned by accident. King Henry III granted him a Royal licence to rebuild his house without crenellating in 1252 and the bailey may be the site. 5 miles south is Amberley Castle and 6 north-west is Petworth House. Park Mount is located west of Pulborough, off Stopham Road. 23 miles north-west of Brighton, on the A27-A283. The site is visible from the public footpath, which passes the castle from Stopham Road.